Jacksonville, NC Bojangles'® Tands, INC. Store #10 - Bojangles'® / Tands, Inc.
Our Jacksonville, NC Bojangles’® provides fast, friendly service and great food at affordable prices — so you can get quick, delicious food on the cheap! Stop by Bojangles’® on LeJeune Blvd and enjoy some of our crispy Cajun chicken, the fresh taste of our homemade biscuits, or a glass of our refreshing Legendary Iced Tea®. Breakfast, lunch or dinner, this Jacksonville, NC Bojangles’® has tasty options that will fill you up and leave you satisfied! 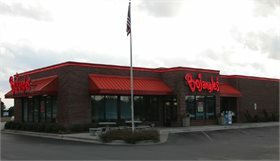 This Jacksonville, NC Bojangles’® is located on LeJeune Blvd near the main gate of Camp Lejeune Marine Base. Bojangles’® is a popular spot for Jacksonville military personnel and their families to stop and enjoy a southern-style meal together. Bojangles’® is honored to serve both the military and civilian communities of Jacksonville, NC!